In many ways it’s a heavy burden for a master distiller to work on a legendary spirit line. That task is even harder when that line is named after a real person who is still alive and kicking. Enrique de Colsa, master distiller for Don Julio tequila, has the enviable and unenviable task of maintaining one of Mexico’s most notable premium tequila lines. Enrique does it with a very good sense of humor and whenever pushed on any aspect of the line happily answers, “That’s the way Don Julio did it”. As a company, Don Julio has a pretty interesting history. Founded in 1942, the first tequila from Don Julio was anything but premium. In the 40’s tequila was an extremely rough product that was reserved for special events or when people really wanted to get the lead out. Ninety-five percent of tequila was sold in bulk and was of a fairly low quality. Don Julio wanted to give higher quality tequila to friends and family so he put it in bottles, and so began a fantastic journey from rough stock bulk spirit to a premium bottled spirit. In 1985 Don Julio suffered a severe stroke and was sidelined from the business. In 1987 he returned and his family threw him a huge party. Instead of the traditional tall wine-like tequila bottles, Don Julio’s family wanted tequila bottles that were short enough so people could see each other across the table. Out of this came the short squat bottles which are now very closely associated with premium tequila. One of the things which makes the Don Julio line so interesting is the way in which they age their tequila. Many tequila makers show increasing impact from wood aging as you move from their Reposado to Anejo and Extra Anejo. Don Julio’s wood impact peaks with their Reposado, and their Anejo is actually lighter and less woodsy. Don Julio is a man who clearly marches to the beat of his own drum and distiller Enrique de Colsa continues this unique spirit with master craftsmanship and vision. 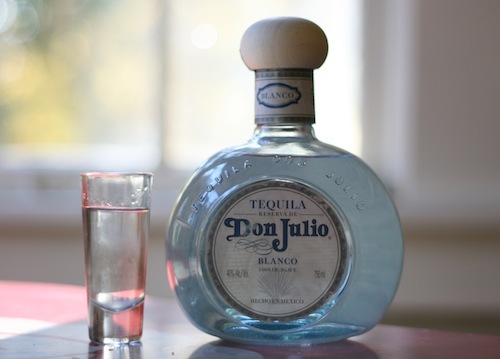 Don Julio Blanco Tequila (80 proof, $35) – As you nose the Don Julio Blanco Tequila, there’s no mistaking that you’re smelling a highlands tequila. With a bright sweet agave nose and light floral hints backed with light citrus/lime, this blanco tequila is extremely inviting. The entry is very soft and easy with sweet floral notes and light pepper. The fresh agave from the nose is very apparent on the palate and comes together beautifully with the floral and peppery notes. The finish is very nice with a light sweet pepper which tapers out into a nice cool clean mouth. Don Julio Reposado Tequila (80 Proof, $40) – Aged for eight months in Jim Beam and Four Roses bourbon barrels, Don Julio’s Reposado is where this line of tequila really starts to get interesting. From the moment you nose the Don Julio Reposado Tequila, you know it’s something different. Deep influence form the bourbon barrels are right there on the nose with caramel, spicy pepper, cinnamon and vanilla. There’s a light note of citrus on the nose, but this time around it’s more orange and grapefruit than lime. The entry is very smooth with caramel, cinnamon and a hint of orange. The mid palate has some nice spice and the cinnamon notes are very pronounced. The finish is long with more cinnamon, some sweet fruit, and spice. Don Julio Anejo Tequila (80 proof, $50) – Here’s where the Don Julio line takes a dramatic turn. While most anejo tequilas show off more of the barrel than the reposado, the Don Julio Anejo actually reflects less. This is because the barrels used to age the Don Julio Anejo are the same second-use bourbon barrels that were previously used to age the reposado. The result of using these barrels is that there’s less of the bourbon influence and barrel flavor, and more pronounced notes from the oxidization from the air inside. Aged for 18 months, the Don Julio Anejo Tequila is remarkably light in color. You wouldn’t ever guess this was an anejo tequila by looking at it. The nose of the Don Julio Anejo Tequila is very soft; instead of caramel and cinnamon, you get much more butterscotch, honey and vanilla. The entry is very smooth and less heavy than most anejos. The opening is big butterscotch and caramel with some light chocolate undertones. The sweet aspect of this tequila picks up in the mid palate with a subtle note of dried fruit. As it moves towards the finish it picks up a slight spicy note which carries through a very nice peppery and cinnamon finish. 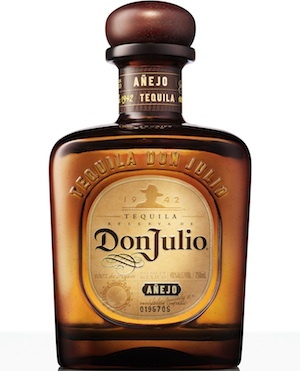 Don Julio 1942 Anejo Tequila (80 proof, $100) – This special release tequila was created to celebrate the 60th anniversary of Don Julio (in 2002). One of the things that sets the Don Julio 1942 apart is that its second distillation is done in a small pot still. 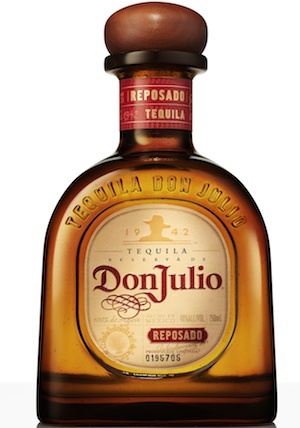 As with the Anejo, it’s aged in barrels previously used to age the Don Julio Reposado. The Don Julio 1942 is aged for over 2 1/2 years (24 – 38 months). 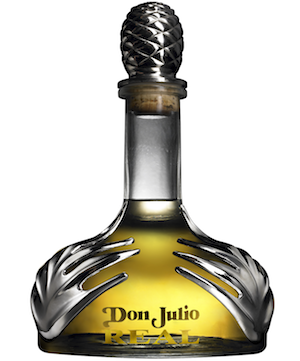 The nose of the Don Julio 1942 is decidedly sweet with thick vanilla and caramel notes. The entry is very thick and soft with very slight amount of cinnamon spice. There are clear notes of salted caramel, cinnamon and pepper, with some butterscotch notes that come in on the mid palate. The finish is unexpectedly dry with the slightest amount of spice and a hint of chocolate at the end. Don Julio Real Extra Anejo Tequila (90 Proof, $350-$400) – At the upper echelon for premium tequila, the Don Julio Real Extra Anejo carries with it a mind-blowing price tag. Very light in color, it’s almost unbelievable that the Don Julio Real Tequila has been aged 3-5 years. The nose is incredibly light and delicate with sweet pepper and citrus. Absent are the deep caramel, butterscotch or vanilla notes you’d expect with an extra anejo. The entry is sweet and spicy all at once, with many of the fantastic classical notes from the blanco preserved but with layers of complexity. Rather than presenting itself in stages, the Don Julio Real Extra Anejo carries its flavors from the entry through the finish without skipping a beat. The balance between sweet and spicy is amazing and the long finish is something that captures all the complexity of flavor. One note we kept digging at was a slightly salty, almost peaty note. It’s an undercurrent in this tequila and it gives it the slightest suggestion of a single malt scotch.